CM-ATR-3U/SEF-18HP: Sealed Extended Fins + 18 Heat Pipes. CM-ATR-3U/HES: Sealed with 4 Heat Exchangers. 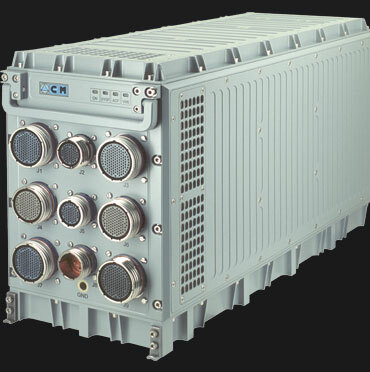 CM-ATR-3U/HES-FBL(3-5-7-9): Sealed, conventional front-to-back format with 4 Heat Exchangers. 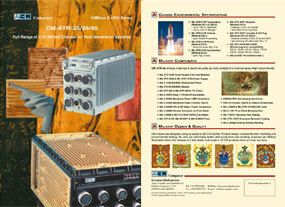 CM-ATR-3U/HES-FBL-HP(3-5-7-9): Sealed + Heat Pipes, conventional front-to-back format with 4 Heat Exchangers. VME64x: Military VME64x Backplane (5 Slot 1" Pitch 3U). 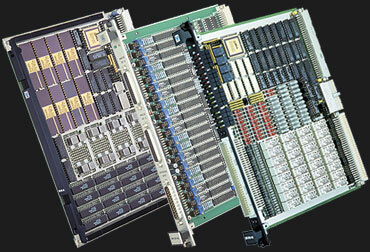 cPCI-S: Military CompactPCI Serial Backplane (3-5-7-9 Slot 1" Pitch 3U). VPX: VITA 46 Military VPX Backplane (3-5-7-9 Slot 1" Pitch 3U). 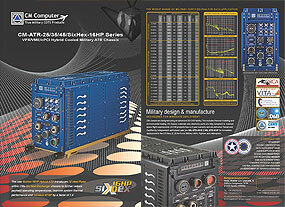 VPX-6: VITA 46 Military VPX Backplane (6 Slot 0.85" Pitch 3U). 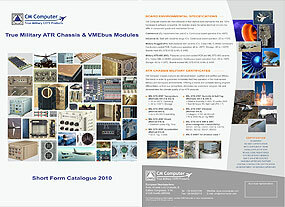 * PSU not available for CM-ATR-3U/FAC & CM-ATR-3U/HES-FBL chassis models. * Fitted as standard on SEF-18HP chassis model. ** Fitted as standard on HES chassis model. ** Fitted as standard on HES-FBL & HES-FBL-HP chassis model. NO wiring clearance. SBC: Standard Bottom Cover. Wiring clearance below backplane 24mm. MCS: Universal Card-cage Slots (mixed Conduction-cooled & Air-cooled Boards)*. * MCS not available for CM-ATR-3U/HES-FBL or HES-FBL-HP models. STDF: 2x60 CFM DC Rugged Fans or 1x60 CFM DC Rugged Fan (FAC). F115-400: Optional 2x65 CFM Rotron PX2 Military Fan for 115 VAC @ 400Hz or 1x65 CFM Rotron PX2 Military Fan (FAC). F200-400: Optional 2x120 CFM Rotron PX2 Military Fan for 200 VAC 3-phase @ 400Hz, 1x120 CFM Rotron PX2 Military Fan (FAC). No rear fan required for /S & /SEF-HP chassis model. Rugged fans with aluminum housing. Operating range: -40ºC to +85ºC. Full military Rotron PX2 AC fans. Operating range: -54ºC to +125ºC. CM-ATR-25: 5 Slot 6U Enclosure (0.8" pitch - ½ ATR type). CM-ATR-125: 5 Slot 6U Enclosure (1" pitch - ½ ATR type). CM-ATR-35: 7 Slot 6U Enclosure (0.8" pitch - ¾ ATR type). CM-ATR-135: 7 Slot 6U Enclosure (1" pitch - ¾ ATR type). 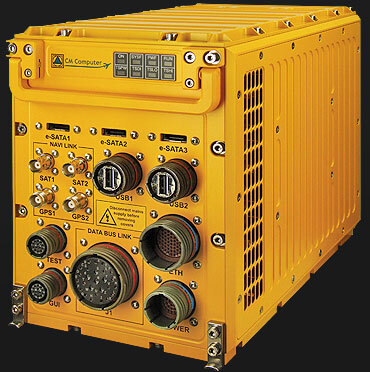 CM-ATR-45: 12 Slot 6U Enclosure (0.8" pitch - 1 ATR type). S: Standard Sealed (0.8" pitch). SEF: Sealed with Extended Fins (0.8" pitch). SEF-HP: Sealed Extended Fins + 18/20 Heat Pipes (0.8" pitch). FAC: Flowthrough Air Cooled (open, non-sealed) (0.8" pitch). HES: Sealed with 4 Heat Exchangers (0.8" & 1" pitch versions). SIXHEX: Sealed with 6 Heat Exchangers (0.8" & 1" pitch versions). SIXHEX-HP: Sealed with 6 Heat Exchangers + 16/20 Heat Pipes (0.8" pitch with 16HP & 1" pitch with 20HP versions). VPX: VITA 46 Military VPX Backplane. VPX/VME64x: Hybrid VME64x split with VPX Military Backplane. VME64x/cPCI: Hybrid VME64x split with cPCI Military Backplane. 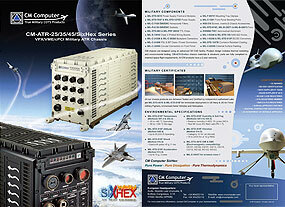 * PSU only available for CM-ATR-125 /HES /SIXHEX /SIXHEX-HP 1" pitch models. B-950W: 28 VDC (+5 VDC @40A, +3.3 VDC @45A, ±12 VDC @16A). B-1100W: All PSUs (+5 VDC @40A, +3.3 VDC @45A, ±12 VDC @21A). D-1350W: 28 VDC (+5 VDC @160A, +3.3 VDC @80A, ±12 VDC @16A). D-1550W: All PSUs (+5 VDC @160A, +3.3 VDC @80A, ±12 VDC @21A). R2x725W: (+5 VDC @20A, +3.3 VDC @23A, ±12 VDC @12A, ±28 VDC @9A). 3.3-75W: 3.3VDC @ 22A (in Lieu of default 3.3 VDC @ 5A). Optional DC/DC AUX0 converter on Backplane fitted for 3.3VDC. Option suited for 1st generation PSU models 300W/400W/500W. Note: If /3.3-75W is not selected, DC/DC power socket AUX0 remains free to the user. D1: 100W Optional DC/DC Converter on Backplane. User-defined output 1. D2: 100W Optional DC/DC Converter on Backplane. User-defined output 2. D1 & D2 Backplane auxiliary DC/DC output options: +2VDC 50W, -2VDC 50W, +3.3VDC 75W, -3.3VDC 75W, +5VDC 100W, -5VDC 100W, +12VDC 100W, -12VDC 100W, +15VDC 100W, -15VDC 100W, +28VDC 100W, -28VDC 100W, +48VDC 100W, -48VDC 100W. Ordering Examples: 48-100W >> 48VDC @ 2A or 2-50W >> 2VDC @ 25A. RA-475W: 28 VDC +5VDC @40A, +3.3VDC @22A, ±12VDC @8A. RB-575W: All PSUs +5VDC @40A, +3.3VDC @22A, ±12VDC @12A. TSU: Optionally installed in backplane (for /S /SEF /FAC models). Note: TSU is fitted as standard in SEF-HP, HES, SIXHEX & SIXHEX-HP models. STC: Standard Top Cover. Wiring clearance 20mm. EHETC: Extended Heat Exchanger Top Cover. Wiring clearance 35mm. * Fitted as standard on SEF & SEF-HP chassis modes. ** Fitted as standard on HES, SIXHEX & SIXHEX-HP chassis models. SBC: Standard Bottom Cover. Wiring clearance below backplane 25mm. HBC: High Profile Bottom Cover (standard on /HES(1") /SIXHEX /SIXHEX-HP models). Wiring clearance below backplane 50mm. F115-400: 1x65 CFM 115VAC @ 400Hz Rotron PX2 Military Fan. F200-400: 1x120 CFM 200VAC @ 400Hz 3-Phase Rotron PX2 Military Fan. F28: 1x65 CFM 28VDC Rotron PX2 Military Fan (through AC/DC converter). F115-400: 2x65 CFM 115VAC @ 400Hz Rotron PX2 Military Fans. F200-400: 2x120 CFM 200VAC @ 400Hz 3-Phase Rotron PX2 Military Fans. F28: 2x65 CFM 28VDC Rotron PX2 Military Fans (through AC/DC converter). F115-400: 2x100 CFM 115VAC @ 400Hz Rotron PX3 Military Fans. F200-400: 2x140 CFM 200VAC @ 400Hz 3-Phase Rotron PX3 Military Fans. F28: 2x100 CFM 28VDC Rotron PX3 Military Fans (through AC/DC converter). F115-60: 2x100 CFM 115VAC @ 60Hz Rugged Fans. F220-50: 2x100 CFM 220VAC @ 50Hz Rugged Fans. F115-400: 4x65 CFM 115VAC @ 400Hz Rotron PX2 Military Fans. F200-400: 4x120 CFM 200VAC @ 400Hz 3-Phase Rotron PX2 Military Fans. F28: 4x65 CFM 28VDC Rotron PX2 Military Fans (through AC/DC converter). F115-400: 4x100 CFM 115VAC @ 400Hz Rotron PX3 Military Fans. F200-400: 4x140 CFM 200VAC @ 400Hz 3-Phase Rotron PX3 Military Fans. F28: 4x100 CFM 28VDC Rotron PX3 Military Fans (through AC/DC converter). F115-60: 4x100 CFM 115VAC @ 60Hz Rugged Fans. F220-50: 4x100 CFM 220VAC @ 50Hz Rugged Fans. No rear fan required for /S /SEF & /SEF-HP models, omit from part number. Rugged fans are fitted with aluminum housing. Operating range: -10ºC to +70ºC. 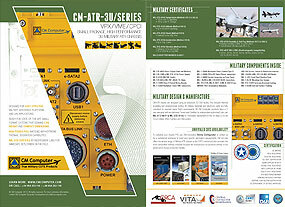 Full military Rotron PX2 & PX3 AC fans. Operating range: -54ºC to +125C. Note: Fan input voltage can be selected independently of main PSU voltage. VAP: Vehicle Air-Plenum according to client specifications (ext. forced air source). EMIG: Optional EMI shielding finger guards fitted with honeycomb filter. GNF: Optional finger guards fitted with low acoustic noise filter (-5dB). 3U: 3U Mounting Tray for CM-ATR-3U, ½ ATR - 5 Slots. 25: 6U Mounting Tray for CM-ATR-25, ½ ATR - 5 Slots. 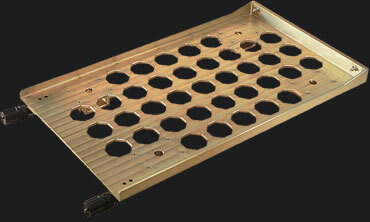 125: 6U Mounting Tray for CM-ATR-125, ½ ATR - 5 Slots. 35: 6U Mounting Tray for CM-ATR-35, ¾ ATR - 7 Slots. 135: 6U Mounting Tray for CM-ATR-135, ¾ ATR - 5 Slots. 45: 6U Mounting Tray for CM-ATR-45, 1 ATR - 12 Slots. SEF-18HP: Sealed Extended Fins + 18 Heat Pipes. FAC: Flowthrough Air Cooled (open). HES: Sealed with 4 Heat Exchangers. HES-FBL: Sealed with 4 Heat Exchangers front-to-back format. HES-FBL-HP: Sealed with 4 Heat Exchangers + Heat Pipes front-to-back format. SEF: Sealed with Extended Fins. SEF-HP: Sealed Extended Fins + 18/20 Heat Pipes. FAC: Flowthrough Air Cooled (open, non-sealed). SIXHEX: Sealed with 6 Heat Exchangers. NOTE: CM chassis mounting trays provide support for shock isolators that are capable of attenuating high vibration environments. 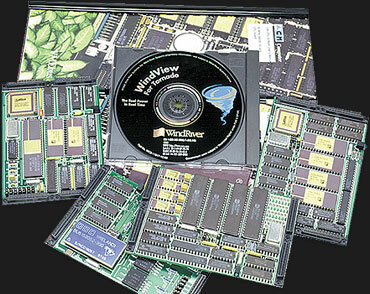 These are not delivered with mounting trays manufactured by CM Computer. Customers must select their appropriate mount solution according to application requirements. 1: Version 1 of module. 2: Version 2 of module. n: n = Version n of module. C: Commercial (0°C to +60°C). Only available with fiberglass PCB. I: Industrial (-20°C to +70°C). Only available with fibreglass PCB. R+: Military Rugged+ (-40°C to +85°C). Only available with conduction cooled PCB. 883: Full Military 883 (-50°C to +90°C). Only available with conduction cooled PCB. A: IEC 297 Standard mechanics with front panel. J2 and front panel I/O connectors. B: IEEE P1101.2 Military mechanics with wedge-locks & J2 I/O connector. 1/2 ATR, 5 slot 1" Pitch, 3U Heat Exchanger Sidewall Enclosure. Auto-range 90-264VAC @ 47-880Hz input power supply. C-575W PSU (+5VDC @ 20A, 3.3VDC @ 22A, +12VDC @ 21A, -12VDC @ 12A). Standard Top Cover. Clearance 13mm. Standard Bottom Cover. Clearance 25mm. Conduction Card-cage Slots (Conduction-cooled Boards Only). 2x47 CFM 115 VAC @ 400 Hz Rugged Fans. 3/4 ATR, 7 slot 0.8" Pitch, 6U Heat Exchanger Sidewalls Enclosure. 7 slot VME64x Backplane for 6U boards fitted with 5 row 160 pin VME64x J0/J1/J2 connectors. A-1050W PSU (+5VDC @80A, ±12VDC @21A, +3.3VDC @45A). Redundant Plug-in PSU with RB-575W (+5VDC @40A, +3.3VDC @22A,±12VDC @12A). Extended high profile top cover. 2x Rotron PX2 military Fan for 115VAC @ 400Hz (130 CFM total). 6U Mounting Tray for CM-ATR-45, 1 ATR - 12 Slots. Designed for HES (0.8" Pitch) model. Module is CM-DA-40 24 Channel Optoisolated 12 Bit Analog Output Module. Version is /1 with 24 D/A channels, 12 bit resolution, without galvanic isolation. Military Rugged+ temperature range (-40°C to +85°C). IEC 297 Standard mechanics with front panel. J2 and front panel I/O connectors. Module is CM-DA-40 (24 Channel Optoisolated 12 Bit Analog Output Module).